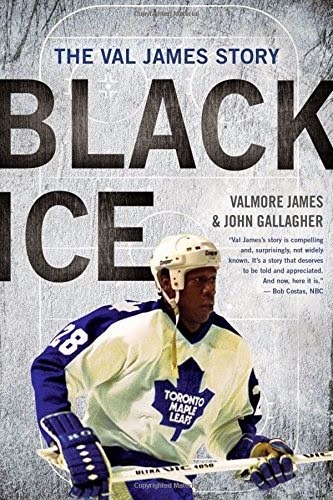 This is the cover image of Black ice, a new autobiography by former NHLer Val James. Who is Val James? He is an almost entirely forgotten about hockey player from the past. But hey, I don't blame you for that. He played only 11 NHL games (plus 3 more in the playoffs) in his career and there are 1000s of guys like that who equally as memorable than him. So why has Val James his autobiography and, more importantly, why should you read it? First off, a bit more about the book. From the back cover, "Val James became the first African American player in the NHL when he took to the ice with the Buffalo Sabres in 1982, and in 1987 he became the first black player of any nationality to skate for the Toronto Maple Leafs. Born in central Florida, James grew up on Long Island and received his first pair of skates for his 13th birthday. At 16, James left home to play in Canada, where he was the only black person in junior and, often, in the whole town. While popular for his tough play and winning personality, the teenager faced racist taunts at opposing arenas, and the prejudice continued at all levels of the game. In his two NHL stints, James defined himself as a smart team player and opponent, known for his pugilistic skills. Black Ice is the untold story of a trail-blazing athlete who endured and overcame discrimination to realize his dreams and become an inspiration for future generations." "His teammates looked away, pretending not to notice that feared hockey enforcer Valmore James was crying . . . Less than one hour earlier, Val and the Buffalo Sabres had finished playing a fierce road contest against the Bruins at hockey's hallowed Boston Garden. The years of dreaming and hard work and fighting - especially the fighting - had all brough him to this point. The moment he took to the ice, on a spring evening in 1982, he had become part of a tiny fraternity of American players who made it to the pinnacle of Canada's national pastime. Much more than that, Val James had become the first black American to ever play in the NHL. There had been no ceremony, no public address announcement. But Val knew. And if his dad were still alive, he would have known, too. Still, the tears were not born of the joy of finally making it to the show. Nor were they from the pride of being the first African American to do so. The tears that slipped past his scarred fists were tears of shame. And rage." Now that is more like it. It immediately draws us in, capturing our attention with an intriguing story, as well as the promise of well written text (John Gallagher writes with James). Unfortunately it turns out that James was crying because some classless Boston Bruins fans were blocking the Sabres team uttering racial slurs, while his teammates stayed silent. "Val was the son of migrant farm workers from the Deep South who moved to Long Island during the JFK years to work on the farms that then filled large swaths of Long Island. Val was introduced to ice hockey at the late age of 13 when his father was hired as a night watchman at the Long Island Arena, home rink of John Brophy and the Long Island Ducks of the old Eastern Hockey League. From these humble roots, Val worked his way up through the lowest minor leagues to a place in hockey history as the first American-born black player to skate in the NHL as a member of Scotty Bowman's Buffalo Sabres. He would also become the first black player of any nationality to play for the Maple Leafs in the hockey mecca of Toronto. Val is remembered as a legendary enforcer and beloved teammate but the untold story of the abuse he had to endure and overcome on the way to his impossible dream is shocking and inspiring." The book ends with a chapter called "As others recall it" where nothing by quotes by former players, coaches and team officials tell some of the James story. Those voices include Scotty Bowman, Mike Keenan, John Brophy, Paul Stewart, Ted Nolan and Nick Fotiu. It is an interesting, honest read. Willie O'Ree was the first Black hockey player in the NHL. So already this book is off to lies. I will never purchase it because of that reason, i won't believe the stories. Willie O'Ree was the first black player in NHL history. But note that he was African-Canadian. Val James can correctly claim to be the first African-American born player in NHL history. There were a few other African-Canadians before James, as well. Can you read, Anonymous? The quote from the book says, "... first African American player in the NHL." Willie O'Ree was was born in New Brunswick.